Looking to learn how you can save some money on the washing machine of your dreams? Well, dream big. The sale is this way! Jump right to the washing machine reviews here! Jump right to the sales & deals here! So when’s the best time of year to buy a washing machine? Studies show that it’s typically between the months of September and October. This is mainly because the major brands are debuting the latest from their line and, therefore, discounting some of their older models. This is when you’ll find the best sales and deals but, truth be told, any time of year can be a good time to upgrade to that washer you’ve been eyeing for a while. Retailers like Home Depot and Lowes are always running pretty impressive sales. Heck, even Amazon is getting into the game where you can get a great deal for a cheap washing machine and have it delivered for free and professionally installed if you’d like. This month we’ve scoured the depths of the Interwebs to uncover some of the best sales, promos and, at times, coupon codes to help you and your wallet save some of your hard-earned money. Just because things are on sale doesn’t mean you have to compromise quality or, you know, buy some random brand you’ve never heard of before. We’re seeing top and front loading washing machines starting anywhere from $399 and some with up to 30% off the retail price. You’ll be able to choose from top selling brands like Samsung, Maytag, LG, Whirpool, GE and more. Not to mention, yes, you can still get that black stainless steel washer you’ve been dreaming about since they came out. Keep an eye on this page (bookmark it if, you know, people still do that) because we’re updating it all throughout the month with the latest and most up-to-date promos. Check out some of the best washing machines on sale (so far) in April 2019. This was the very first washer that was actually decided for pods so, needless to say, they were way ahead of the game. It’s also an extra large (4.4 cu. ft.) to it’s actually big enough to easily fit a king-size comforter. It has 9 wash cycles too, like a 15 minute fast-wash, steam, hand-wash, sanitize, and more! Currently it’s been rated 4.6 out of 5 stars with over 90% of the 500+ reviews giving it 5 stars! Learn more here! We’re still pretty much obsessed with all things Samsung. Almost every major appliance in our home is from Samsung. We’re loving this fingerprint-resistant black stainless steel option (yes!) because of how fast it can do our laundry. They have a super quick “Super Speed” option where you can get a full load down in as quick as 36 minutes. Even better, if you’re like us and always forget to put something in it after it’s already started it’s cycle (and you’re locked out!) you can take advantage of the little “AddWash” door where you can quickly toss in anything you’ve forget (hello random dropped sock!). Plus, this is a smart appliance so you can connect it to WiFi and use the app on your phone or tablet to control just about everything. We love it! It also comes in white if stainless steel anything isn’t your jam. Learn more here! This gets our vote for one of the best-of-the-best “no-frills washers,” but doesn’t compromise one bit of quality and efficiency. We won’t lie, we also love the “cheap factor” of this one, the 4 out of 5 star ratings it currently has, and the over 10,000 customer reviews! Oh, and did we mention it also qualifies for free delivery? Perfect. Like some of the other ones that are at much higher prices, there’s also a Speed Wash option so you can do a quick load when you’re on the run for the day and not be tied down to the house. Learn more here! Does this one not look like it’s from the future?! Don’t let the minimal design fool you, this one packs a punch! It’s 5.0 cu. ft. and can hold extremely large loads. If you’re like us and basically toss all of your laundry into one giant load, well, this may just be the pick for you! It has 12 different washing options, including a TurboWash feature where you can basically cut your wash time down by a half-hour (30 minutes). What will we do with that extra time!? We also love the Speed Wash option where, if you have quick small load to do (hello pair of nasty jeans and shirt), it’ll get it clean in about 15-minutes. A total score! Learn more here! Another great no-frills option that you can typically get for under $700. This one currently has 4.5 out of 5 stars from over 1,500 customer reviews! 92% of those reviews have it 5 stars and would recommend this washer. It comes with a PowerWash agitator that’ll help get rid of pesky stains on almost any size load. We also loved the water efficiency. It can detect the amount of water needed thanks to its auto-sensing option that will adjust the water level for each and every load. Sometimes we love a simple white finish, like the one above, but it also comes in metallic slate grey if that’s more along the lines of what you’re looking for. Learn more here! High-efficiency is where it's at in the washing machine game! Right now this month you can save upwards of 25% off the original price (and in a few cases, 29%!) on this high-efficiency washers from brands like Maytag, Electrolux, LG, Whirlpool, and more. Looking for that must-have Samsung washing machine? 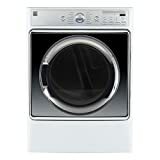 For a limited time you can save up to 18% on select top-selling Samsung washers at Home Depot. Choose from platinum, stainless steel, black stainless, white, and more. We're eyeing the washer with the "AddWash" door! Ready to enjoy up to 20% off these select LG washing machines? Get 'em while you can! We're talking front load and top load washing machine ranging in size from 4.5 all the way up to 10.0 cubit feet. Choose from classic stainless steel, white, black, red, or graphite steel grey. Black stainless steel is all the rage in the large appliance world. If you're tired of seeing a sea of regular stainless steel (hello every single item in my kitchen), black stainless is the way to go. 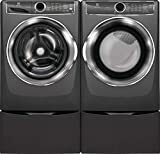 Right now you can enjoy up to 30% off select black stainless steel washing machines at Home Depot. Choose from major brands like Samsung, LG, and more! BestBuy is getting in on the deals game and have a major sale on some of their best-selling washers from killer brands like GE, Samsung, Whirlpool and more. Check out the trendy black stainless steel options on sale right now too! There's a great promo going on right now at Lowes. You can now get up to 30% off these select front-load washing machines. Choose from some of the top major appliance brands like GE, Maytag, Samsung, Bosch and more. And the finishes are pretty sharp too. WE're talking about red, white, black stainless, graphite stainless, and more. These also come with FREE delivery right now. How can you go wrong?! Cheap alert! If you're looking for a new washing machine and don't want to break the bank, but still don't want to compromise quality, you're in luck! Right now at HD you can choose from a variety of top brand washing machines all under $400. Choose from brands like LG, Samsung, and Amana. If you don't mind white, you're good to go. These are literally the hottest sales and deals on washing machines going on right now at JCPenney. Some of these washers are actually starting at $399 and many are upwards of 30% off the regular price. Check out some of the top sellers from Samsung, GE, LG, and more! Many of these also come with up to $500 in rebates. Go! Go! Go! You can't go wrong with a trusted name like Whirlpool. This month we're seeing some of the top-selling top-load washers from Whirlpool on sale at Lowes anywhere from 10% - 30% off the retail price. Did we mention these also include free delivery? Let the savings begin! Looking to go the stackable washer route? Well look no further. These stackable washing machines are on sale right now and you can save up to 34% off the original price. We're talking potentially hundreds of dollars in savings. Pick from your favorite brands like Whirlpool, Samsung, Maytag, GE and more right now at Home Depot. Looking for One of the Best 4K TVs This Year? This Way! Some of the Best Mountain Bikes of the Year!